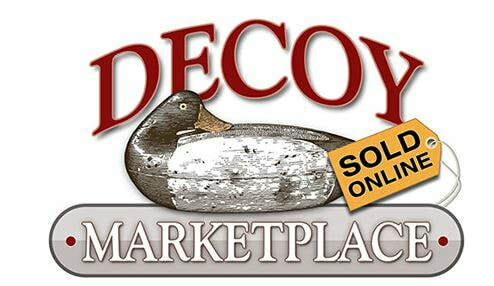 Now you have another place where you can buy your decoys online. 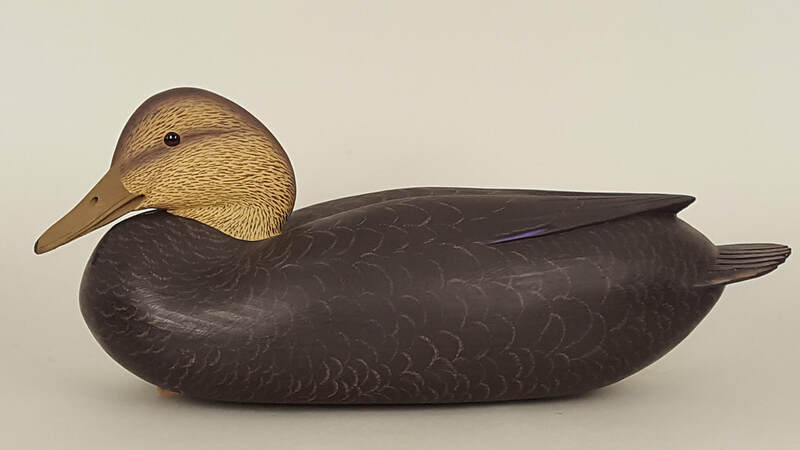 Hollow black duck by Charles Hart of Glouchester, Massachusetts, ca. 1920, with terrific carving detail and in excellent original paint. 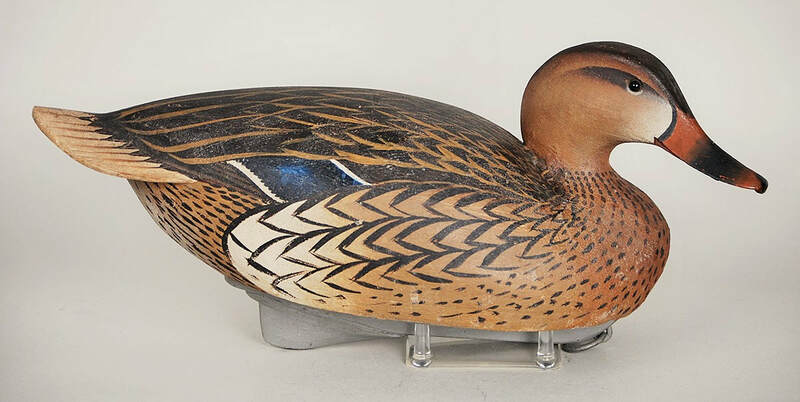 Balsa-bodied wigeon hen by the Ward brothers of Crisfield, Maryland, 1940s. 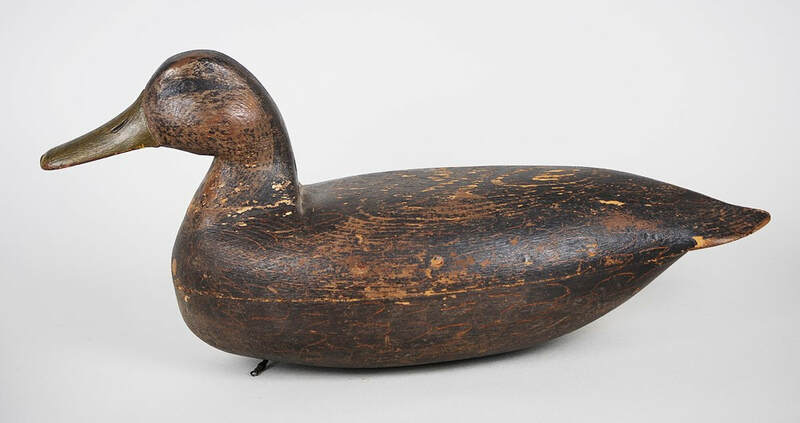 Balsa-bodied mallard by the Ward brothers of Crisfield, Maryland, 1940s, never rigged. 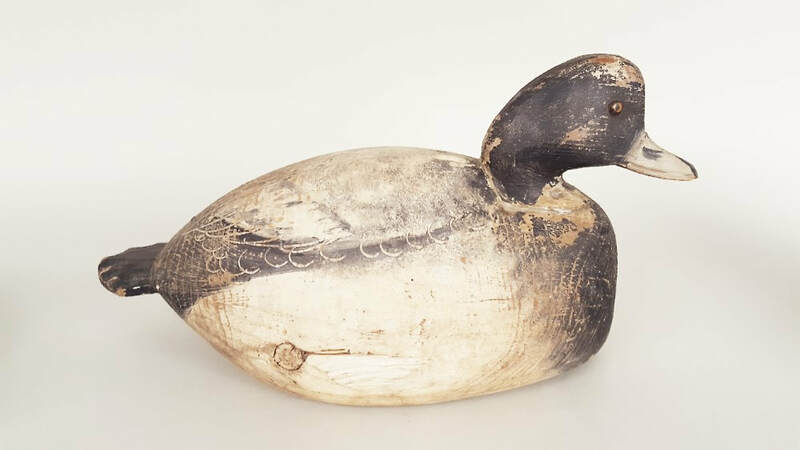 Balsa-bodied mallard hen by the Ward brothers of Crisfield, Maryland, 1940s, fully rigged. Running curlew from Cobb Island, Virginia, ca. 1880. 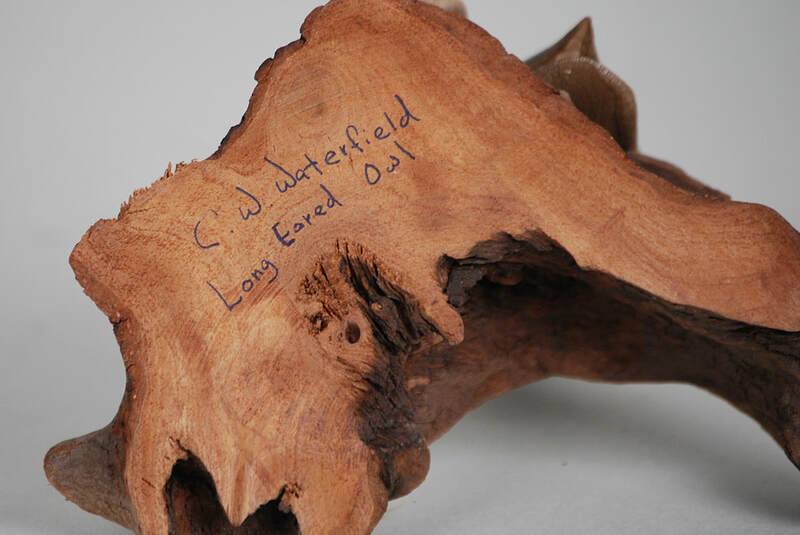 Ex-collection of David Rockefeller. Scoter with a 90 degrees turned head by Gus Wilson of South Portland, Maine, ca. 1920 in old gunning paint. Terrific form! Bluebill hen by Ira Hudson of Chincoteague Virginia, ca. 1920. 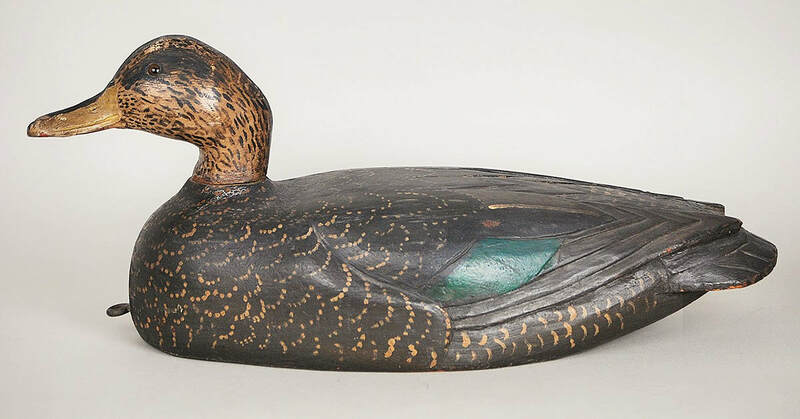 One of Hudson's earliest decoys in near mint condition. 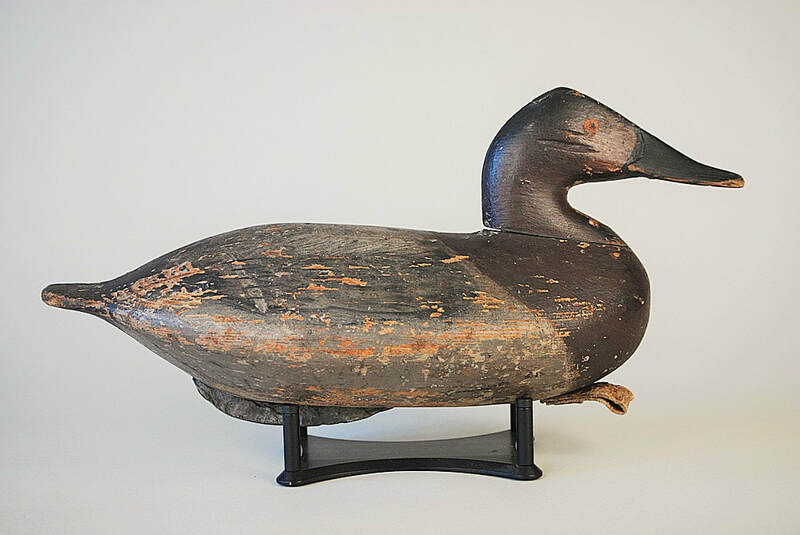 Canvasback wooden wing duck by Charles Nelson Barnard of Havre de Grace, Maryland, ca. 1930. Excellent original condition. Oversized canvasback by Jim Currier of Havre de Grace, Maryland, ca. 1950. Merganser hen by Halstead Brown of Noank, Connecticut, ca. 1920s. Bluebill by Ira Hudson of Chincoteague, Virginia, ca. 1940. Wonderful deep body form in original paint with a nice dry surface patina. 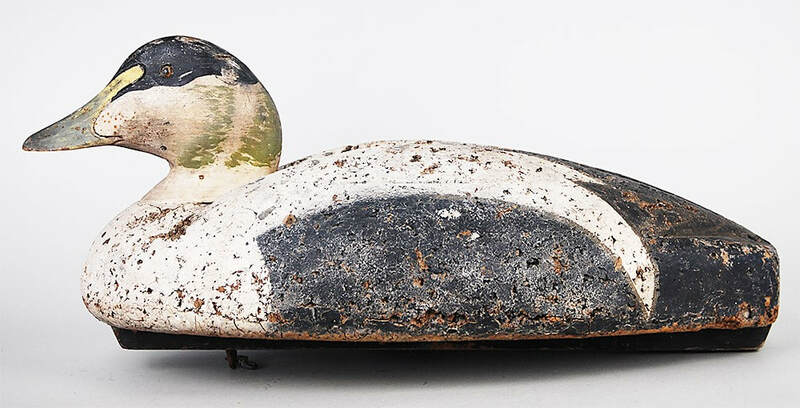 Goldeneye by the Sperry Decoy Co. of Connecticut, ca. 1930s. Hooded merganser by Oliver King of Port Severn, Ontario. Bluebill by the Ward brothers of Crisfield, Maryland, ca. 1930. Cheeky, bulbous head with nicely carved wings. Great early bird! Green-winged teal hen by William Kemble of Trenton, New Jersey, ca. 1910. Good original paint. New Jersey teal are very rare! 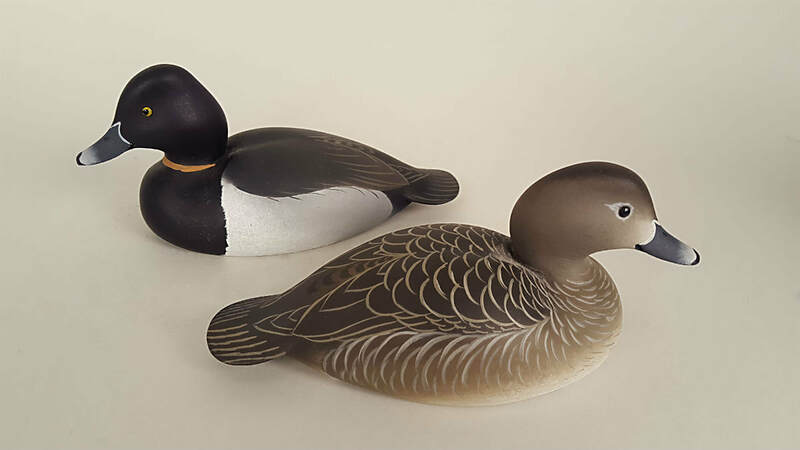 Challenge grade brant by the Mason decoy factory of Detroit, ca. 1915. 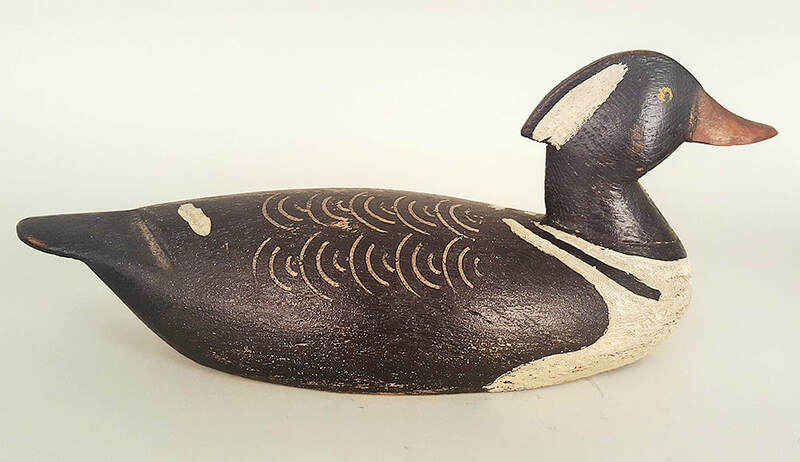 Canvasback hen by Henry Lockard of Elk Neck, Maryland in Bob McGaw paint, ca. 1915. Rare wigeon by Tom Wilson of Ipswich, Massachusetts, ca. 1920. Never rigged. Black duck by Lonnie Ganung of West Haven, Connecticut, ca. 1920. 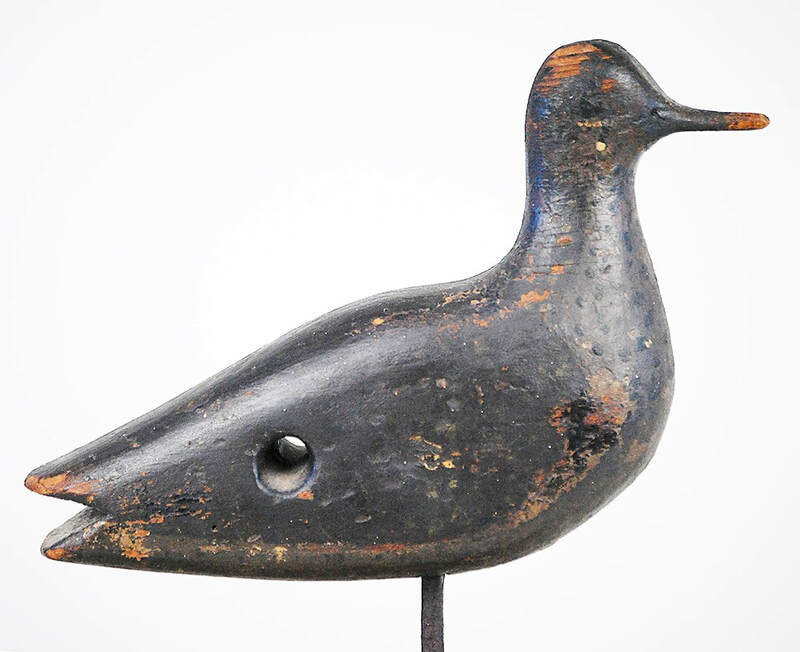 Bluebill by Chauncey Wheeler of Alexandria Bay, New York. Bluebill by Jimmy Clark of Toronto, Ontario, Canada, ca. 1930. 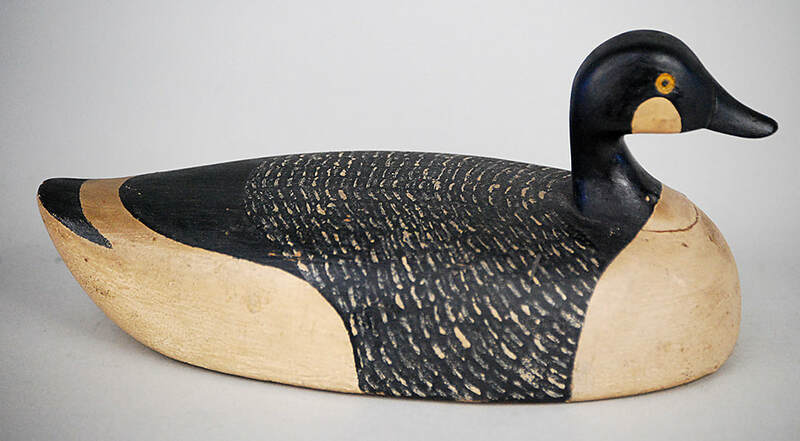 Hollow-carved black duck by Joe Tom Cranmer of Manahawkin, New Jersey, ca. 1920. Ex-collection of John Hillman. Pictured at the bottom of the Cranmer black duck with the Hillman collection stamp. 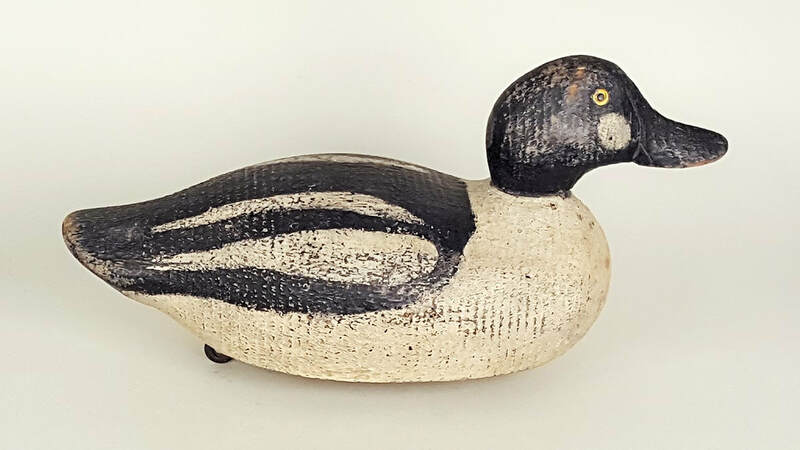 Hollow-carved brant by Rowley Horner of West Creek, New Jersey, ca. 1920. Mostly original paint. Black-bellied plover, possibly from the Canadian Maritimes, ca. 1900. Gunners carry hole drilled through the body. 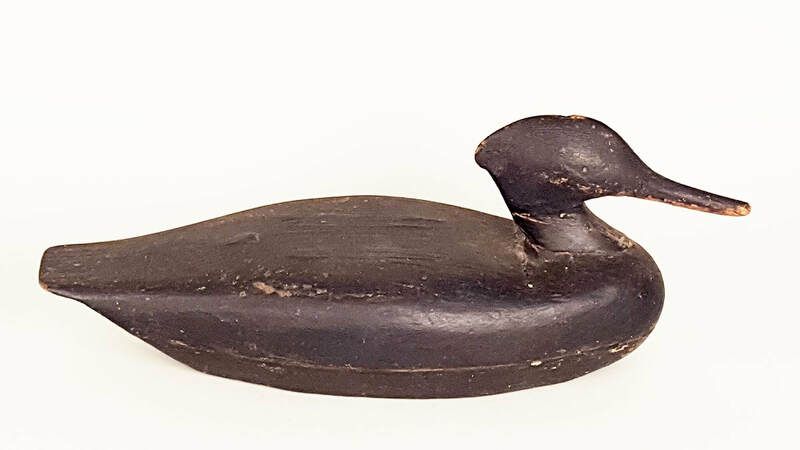 Diminutive bluebill decoy from Crisfield, Maryland, ca. 1920. All original. Rigging removed. Cork-bodied eider by L.L. Bean of Freeport, Maine, 1950s. Nice condition and fully rigged. Canvasback hen by Scott Jackson of Charlestown, Maryland, ca. 1890. Old gunning repaint with excellent surface patina. Glass eyes that were later added have been removed. Fully rigged. 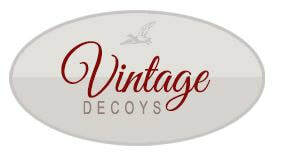 A rare Cecil County decoy by one of its few celebrated makers. 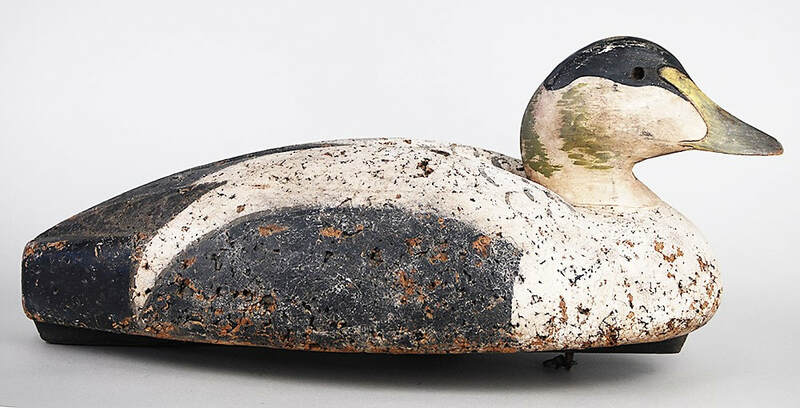 Canvasback hen by Jim Currier of Havre de Grace, Maryland, ca. 1920. Early "Roman nose" style with Cecil County style "angel wing" paint pattern. Wonderful dry surface with no structural repairs. The weight has been removed by an early collector. Canvasback by Bob McGaw of Havre de Grace, Maryland, ca. 1930. Good original paint and condition. 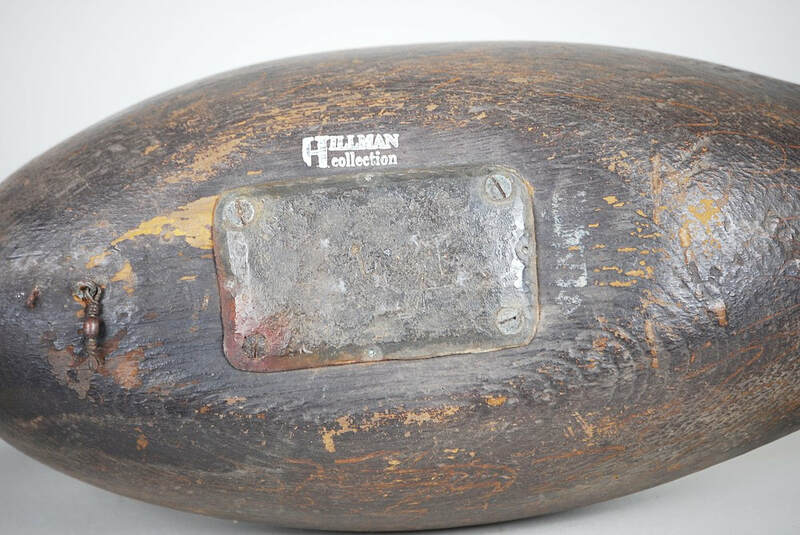 Half of the "dog bone" weight has been removed by an early collector so that it would sit on a shelf. 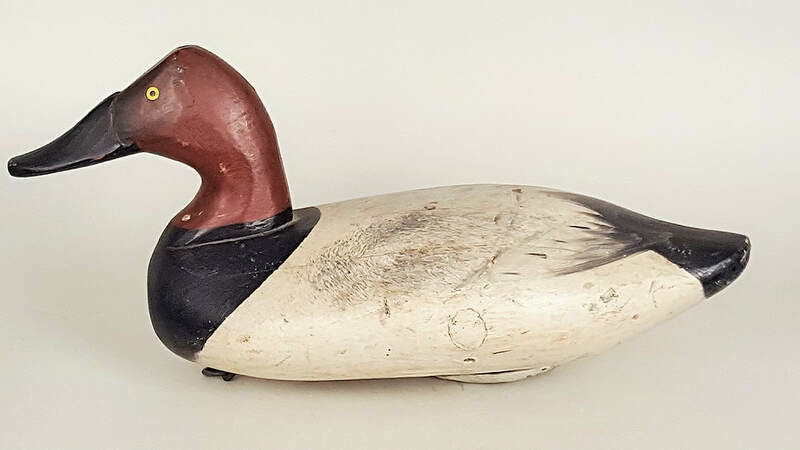 Similar in style to the McGaw canvasback that appeared on a U.S. postage stamp. Black duck by Madison Mitchell of Havre de Grace, Maryland, ca. 1955. 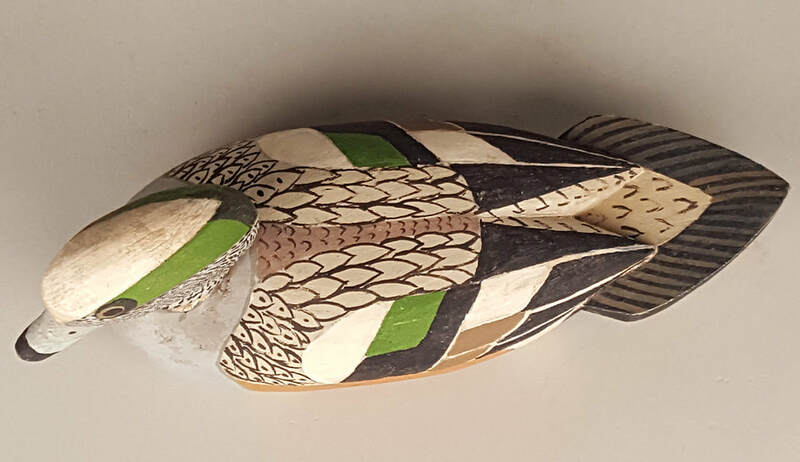 Nice early gunning decoy with excellent scratch feather painting. Fully rigged. Sleeping black duck by Madison Mitchell of Havre de Grace, Maryland, ca. 1938. 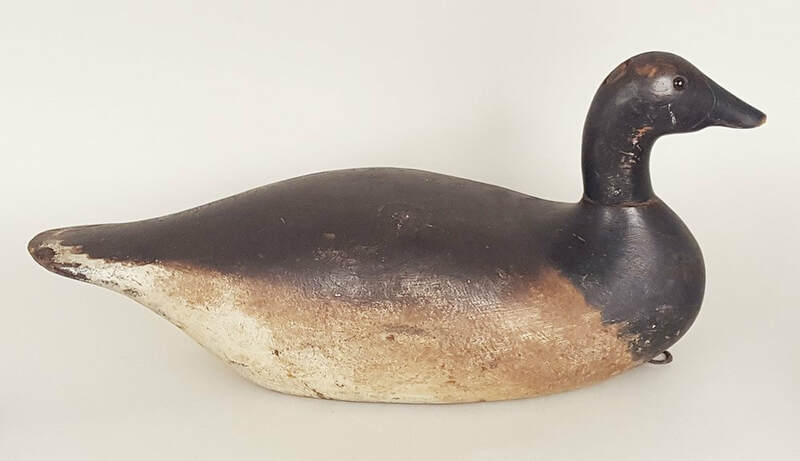 Rare sleeping model puddle duck from the Brummett rig, which included pintails and black ducks and was used on the Delaware River. Fine scratch feather paint. Check on the bottom. 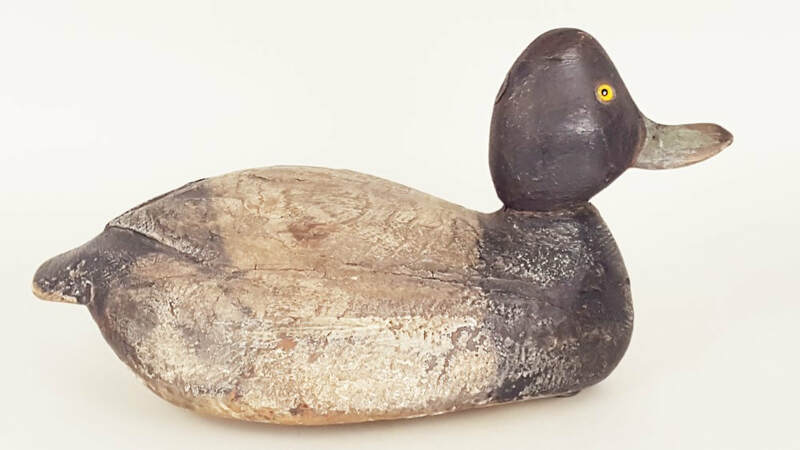 One of the earliest puddle ducks ever made in Mitchell's shop. Redhead by John "Daddy" Holly of Havre de Grace, Maryland, ca. 1870. Mixture of original and old gunning repaint. Nice dry surface patina with wear to bare wood in a couple of spots. Crack in one side of the neck. 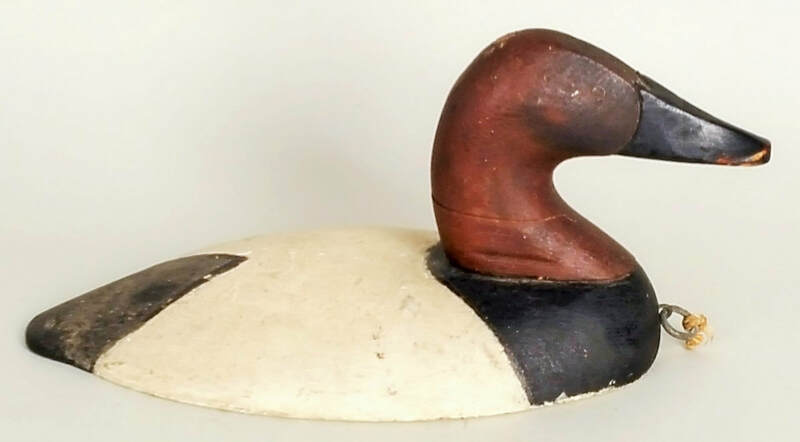 Nice example of an early Susquehanna Flats decoys. 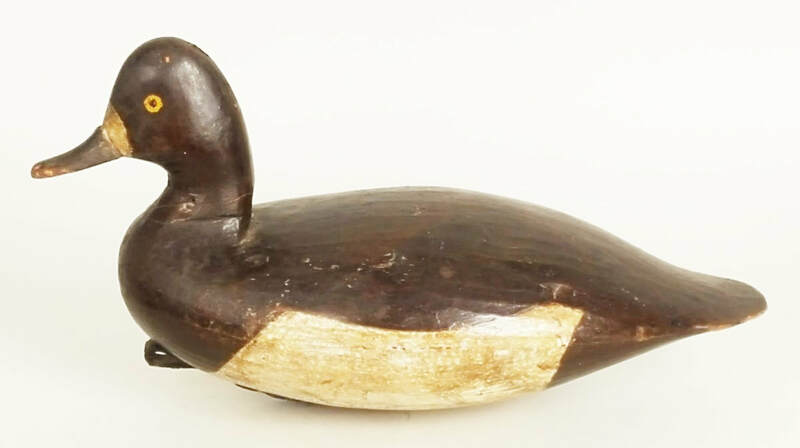 Hollow-carved black duck from Cape May County, New Jersey, ca. 1920. 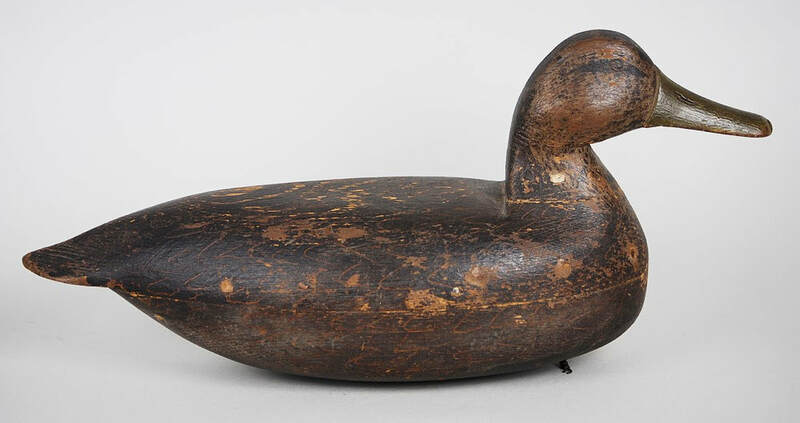 This large oversized decoy, used on the Delaware Bay side of the peninsula, has excellent sculptural form. Paint may have been restored at some point. Fully rigged. Similar to the work of Townsend Godfrey, but as yet it was carved by an unidentified maker. Old squaw from coastal Maine, ca. 1900. 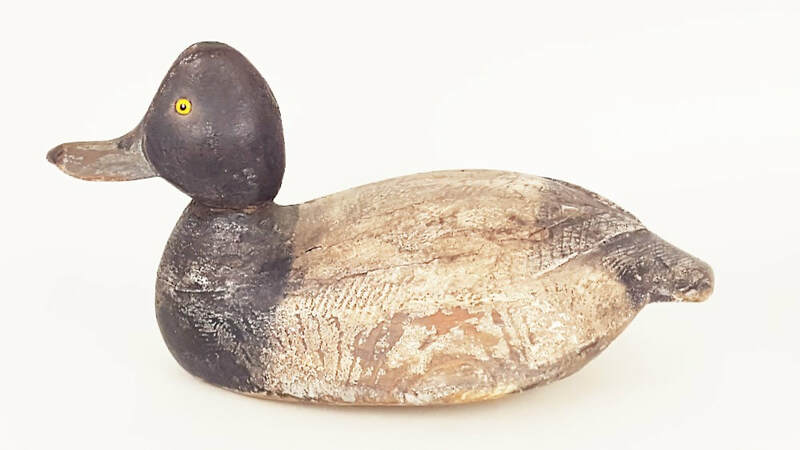 Tiny flat-bottomed decoy, fully rigged, with wonderful paint pattern and dry surface patina. A folk art delight! Hooded merganser hen by Leonard Jester of Chincoteague, Virginia, ca. 1950. Leonard was the nephew of Doug Jester and worked in his shop. This "hairy head" is in near perfect condition and fully rigged. Pintail hen by Madison Mitchell of Havre de Grace, Maryland, ca. 1940. 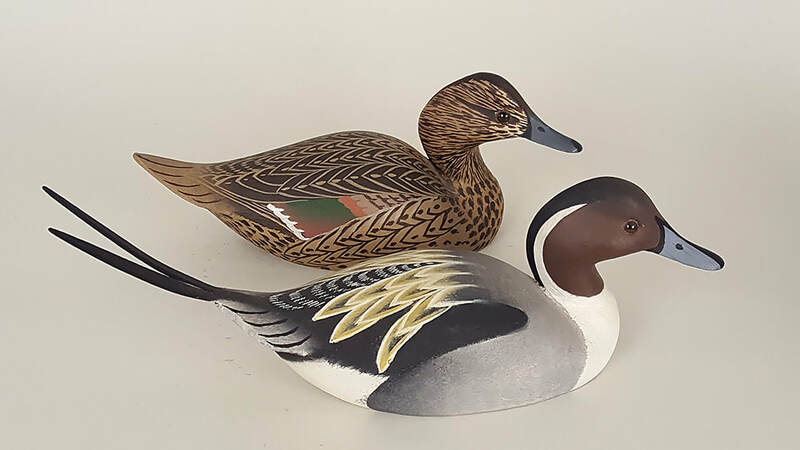 This decoy has Mitchell's earliest paint pattern - most pintail hens have scratch feather paint. Fully rigged. Some damage to the top of the tail. A rare hard to find example. Blue-winged teal by Don Gearhart of Tulsa, Oklahoma, ca. 1930. 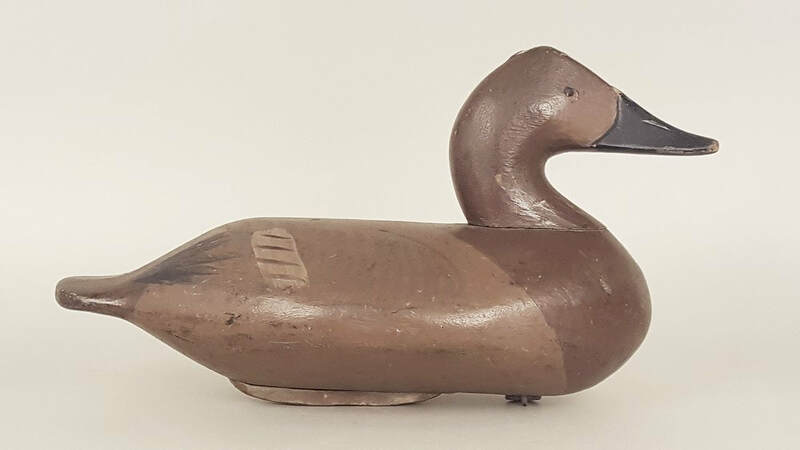 This decoy has a unique weight that fits into the keel on its bottom. It is marked with his name and place of origin. Original paint with some wear throughout, particularly a spot on the head. A delightful little decoy. Bluebill by an unidentified maker from Ontario, Canada. 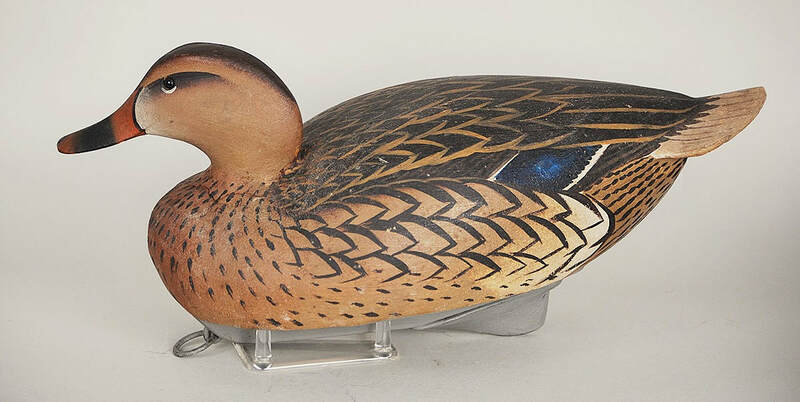 Flat-bottomed, solid-bodied decoy with nicely applied combed-painted tail feathers. Bulbous head gives it an animated folky look. While the maker is unknown, it appears to be from the Toronto area. Redhead by an unidentified maker from Upstate New York, ca. 1920. Folky, almost "helmet-like" head. Near perfect original paint. Branded "T Wlson" on the bottom. Ex-collection of Colonel Connor. Red-breasted merganser by an unidentified maker from Long Island, ca. 1900. Terrific carving to the crest gives the head a very folky look. Nice early North Shore decoy. "Big Eyed" yellowlegs by an unidentified maker from Long Island, New York, ca. 1870. Nice early shorebird with the head slightly cocked. Nice surface patina. Partial bill replacement. Ruddy turnstone from the well-known Bennett rig, ca. 1990. Coastal New Jersey was one of the few areas in the country where ruddy turnstone decoys were made and used. Old gunning repaint. Excellent paint pattern. Matched pair of long-billed curlews by an unidentified maker from coastal New Jersey, ca. 1890. Long-billed curlews are among the rarest species of shorebird decoys, and these two are rigmates. Somewhat thin bodies and absolutely original bills. Excellent original paint and condition. It's amazing they survived their years of usage. 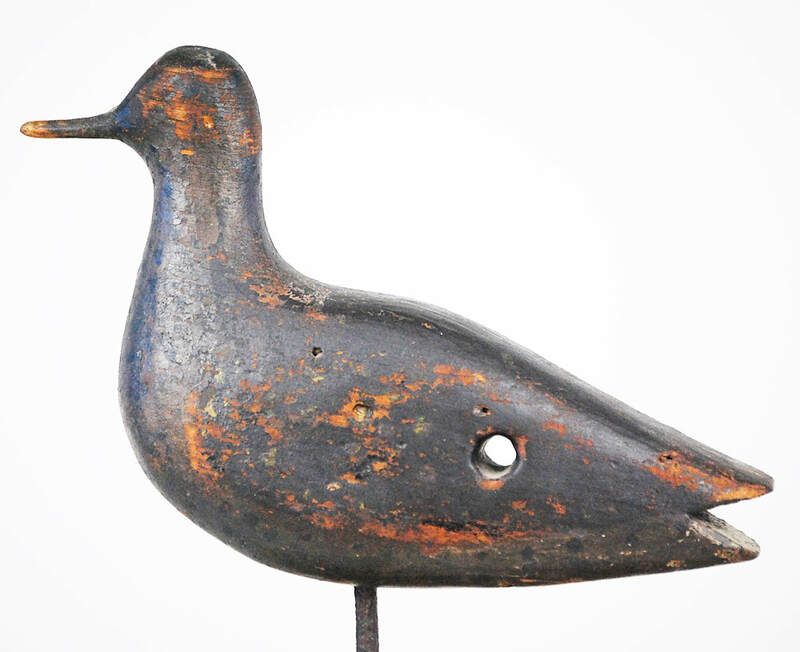 Excellent examples of early American folk art. Red-breasted merganser by an unidentified New Jersey maker, ca. 1880. Early hollow pegged construction and nice crusty surface patina. One side is a little "bleached out," possibly due to exposure to the sun. Diamond-shaped pad weight on the bottom. 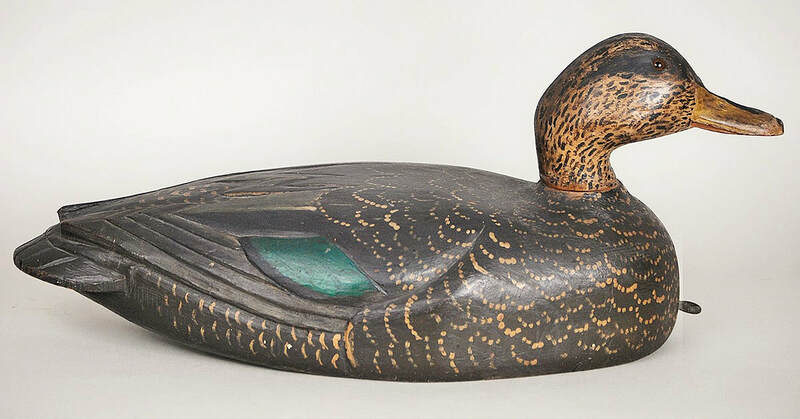 Black duck by Rhodes Truex of Atlantic City, New Jersey, ca. 1915. 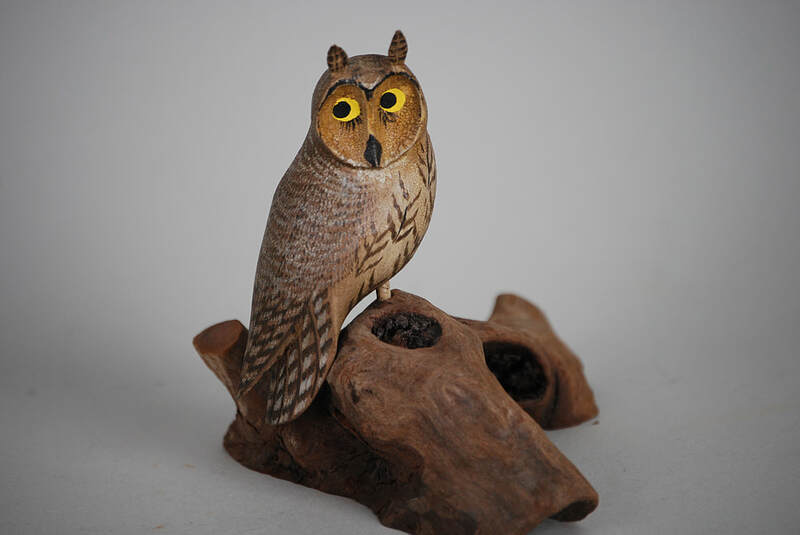 Hollow-carved construction, carved eyes and inletted weight. Small repair to a chip in the tail. Terrific form. 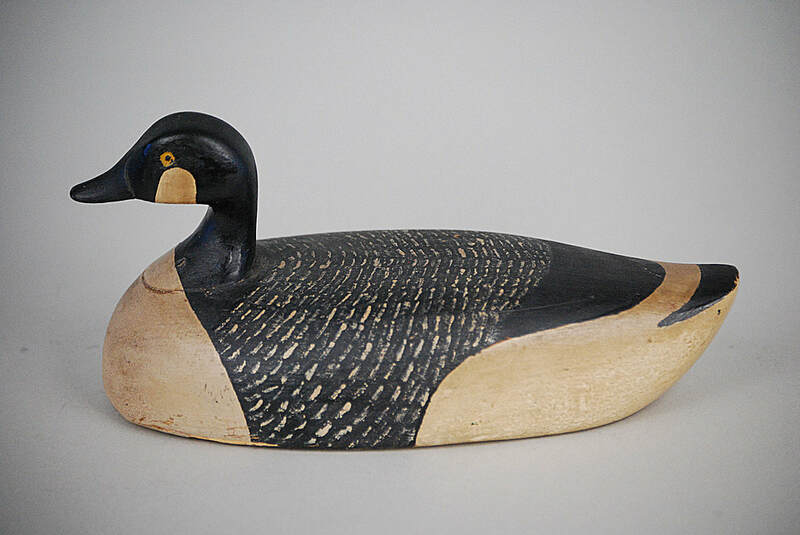 Canada goose by Charlie Joiner of Chestertown, Maryland, signed and dated 1952. Perfect condition, never rigged nor used. 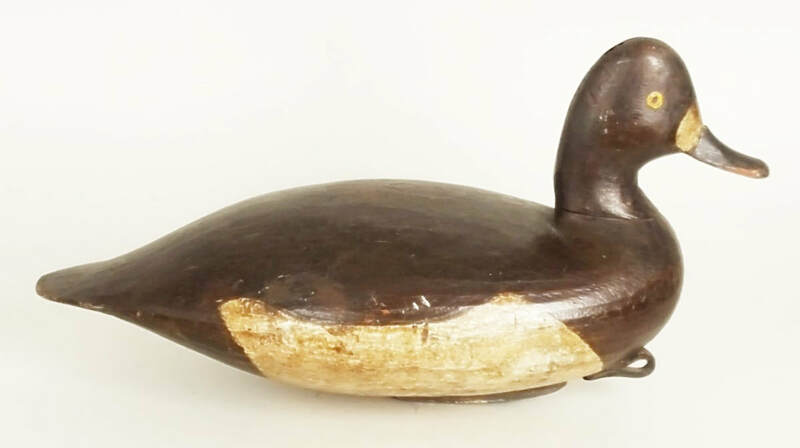 This is the finest example of a Joiner goose decoy that we've ever seen. Miniature goldeneye by Dan Brown of Salisbury, Maryland, 1966. 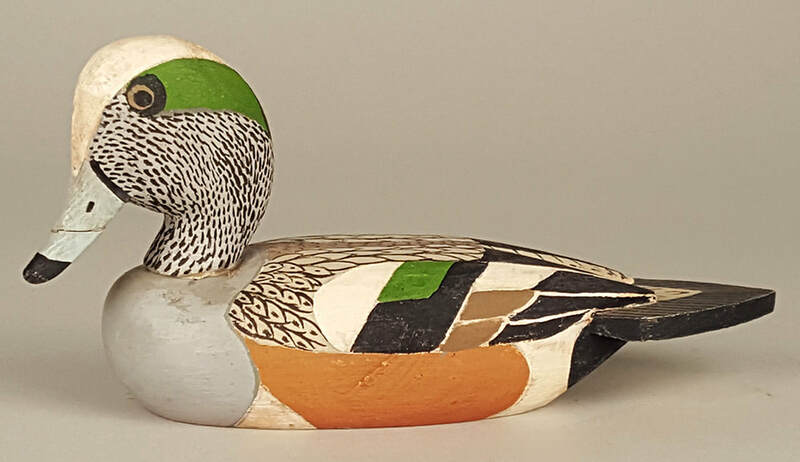 Miniature shoveler by Dan Brown of Salisbury, Maryland, 1966. 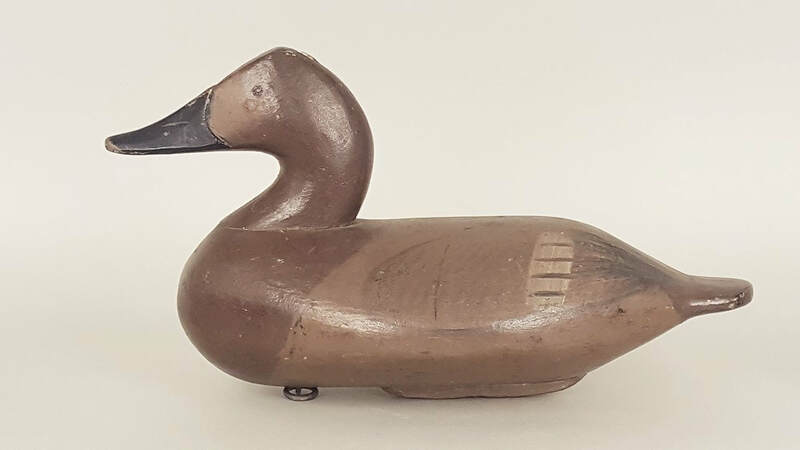 Miniature Canada goose by Bob McGaw of Havre de Grace, Maryland, 1930s. 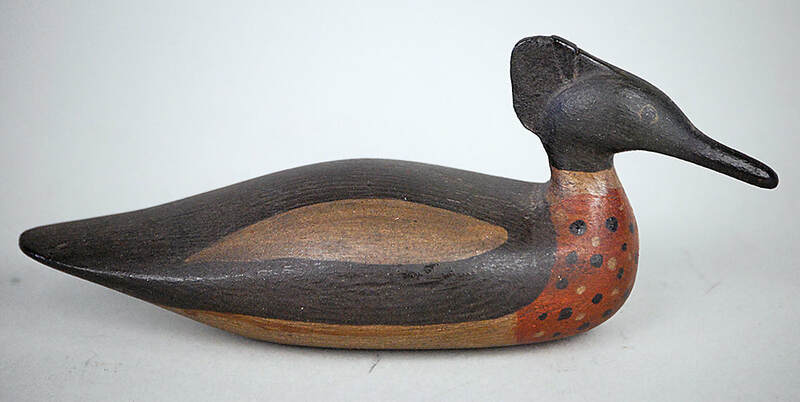 Miniature wood duck by Ken Harris of Woodville, New York. 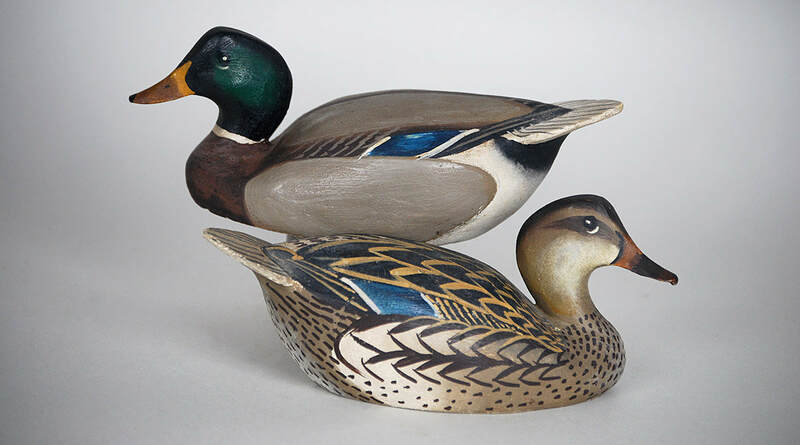 Pair of miniature mallards by the Ward brothers of Crisfield, Maryland. 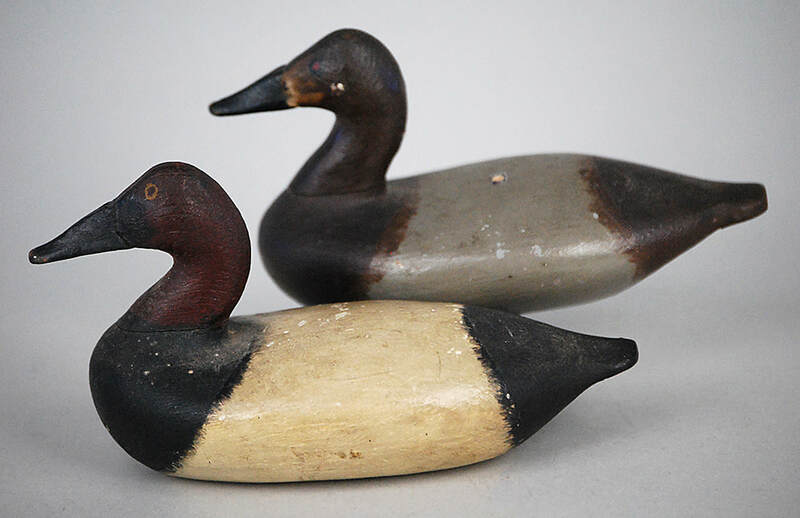 Miniature ringneck pair by Oliver Lawson of Crisfield, Maryland, signed and dated 1981. Pair of miniature goldeneyes by Oliver Lawson of Crisfield, Maryland, signed and dated 1982. 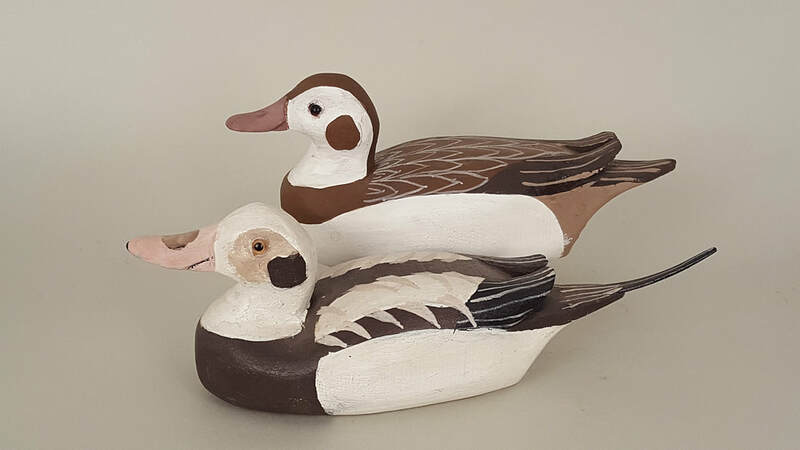 Pair of miniature wigeon by Charlie Joiner of Chestertown, Maryland, signed and dated 1983. 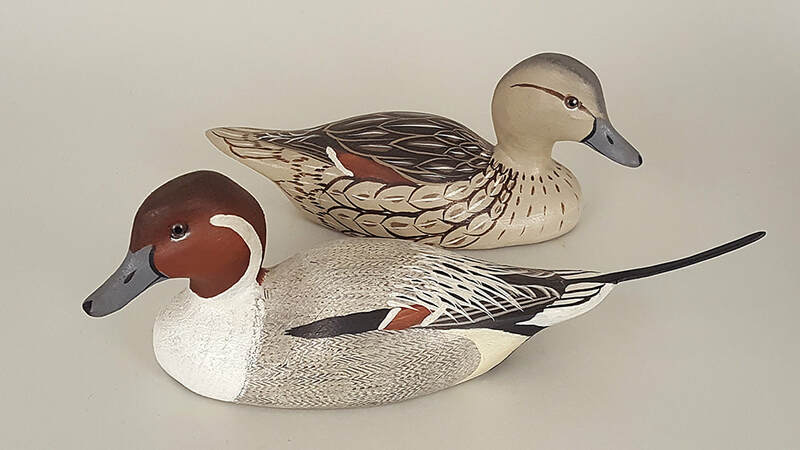 Miniature pintails by Armand Carney of Tuckerton, New Jersey, 1970s. 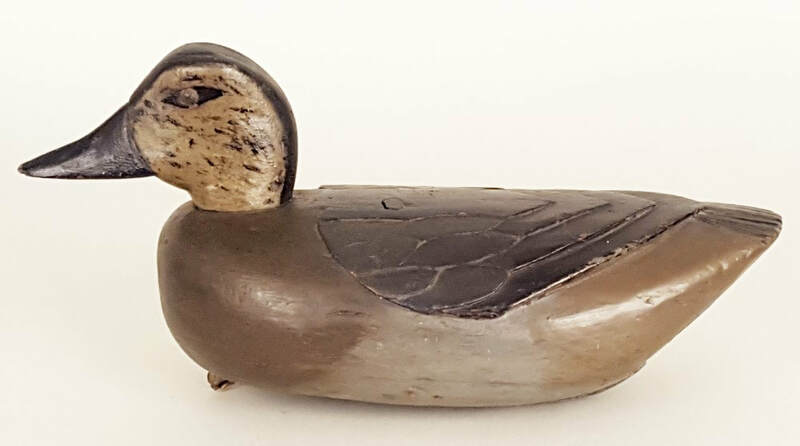 Miniature balsa-bodied mallard hen by Oliver Lawson of Crisfield, Maryland, 1950s. 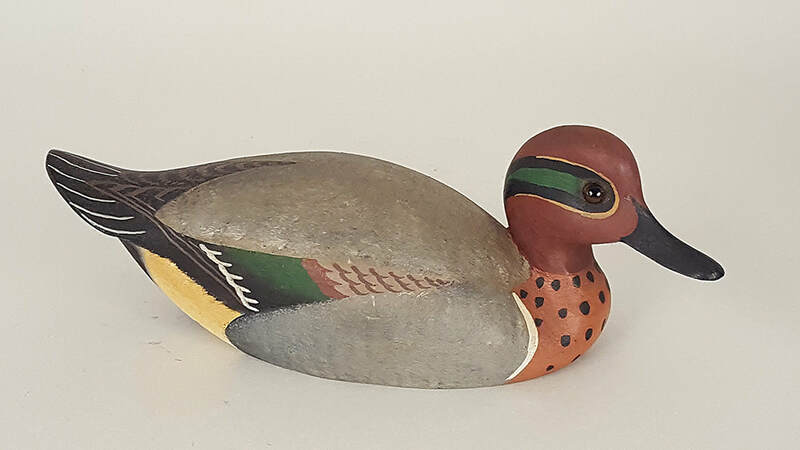 Miniature mallards by Charlie Joiner of Chestertown, Maryland, signed and dated 1969. Miniature green-winged teal by Bill Cranmer of Spray Beach, New Jersey, 1960. Miniature pintails by Bill Cranmer of Spray Beach, New Jersey, 1970s. 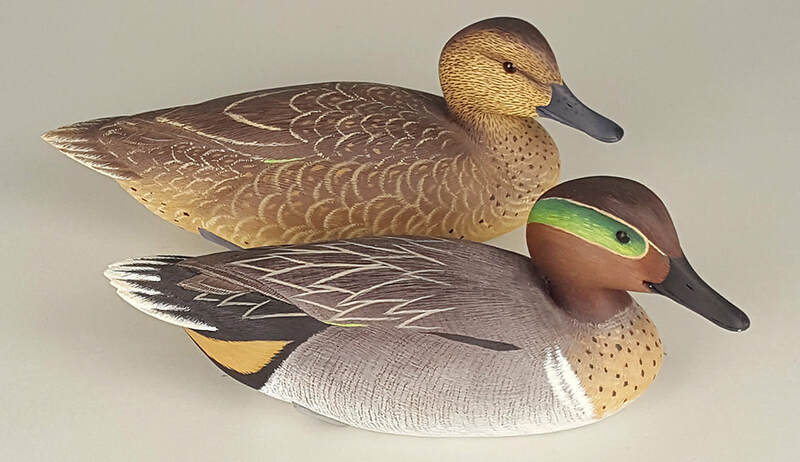 Pair of miniature blue-winged teal by Charlie Joiner of Chestertown, Maryland, signed and dated 2006. 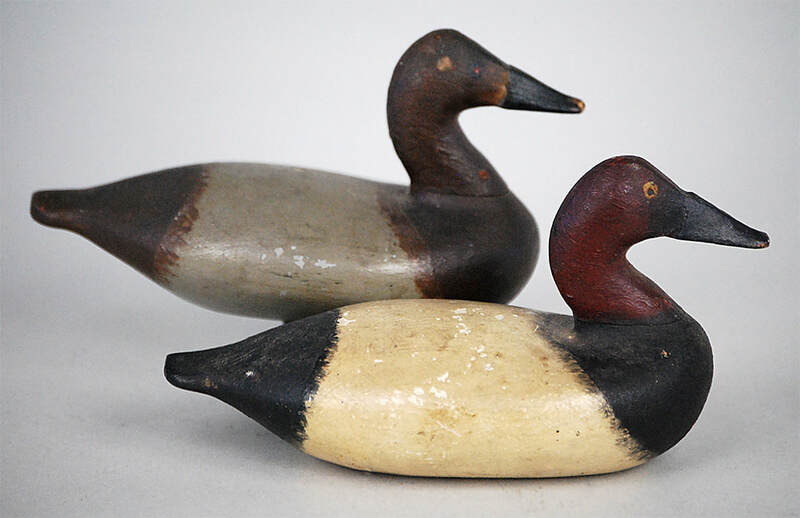 Pair of miniature shovelers by J.P. Hand of Cape May Courthouse, New Jersey. 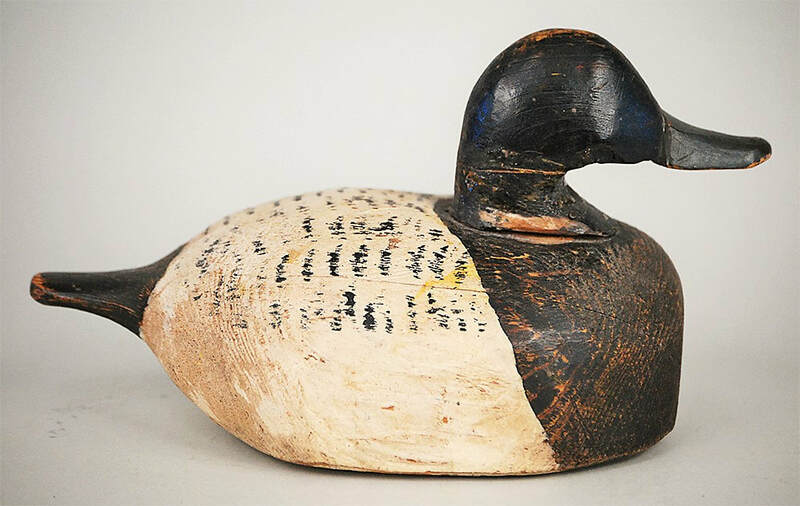 1/2-sized (12 inches) snow goose that Al Glassford of Scarborough, Ontario made for Hal Sorenson in 1967. 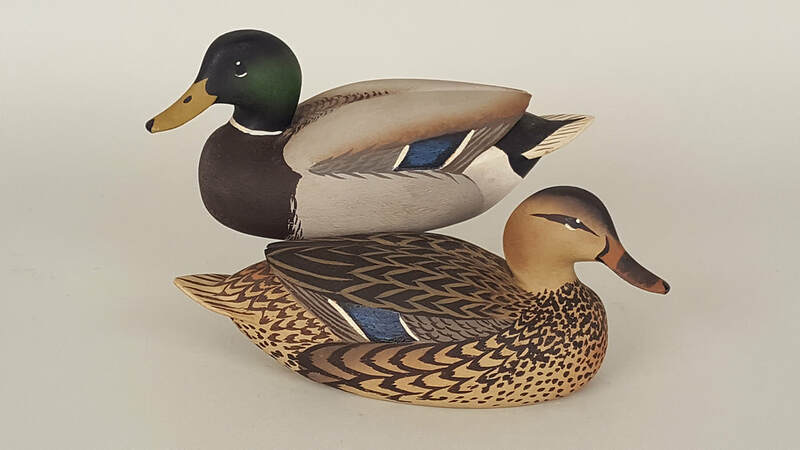 Pair of miniature mallards by Oliver "Tuts" Lawson of Crisfield, Maryland, ca. 1960. 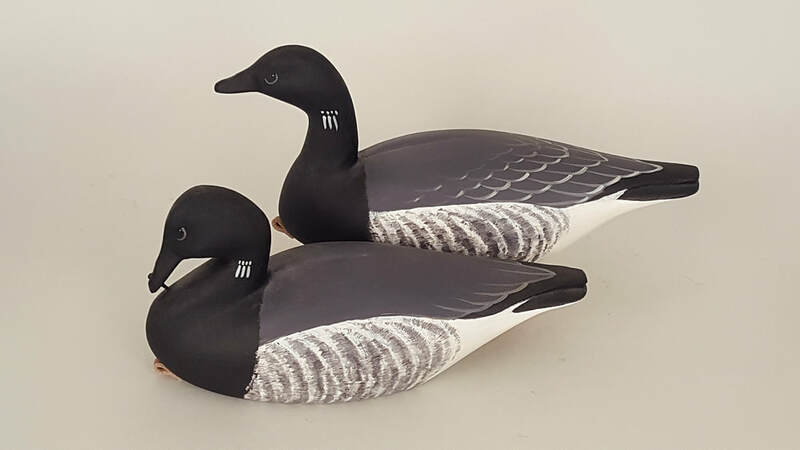 Pair of miniature brant by David Rhodes of Atlantic City, New Jersey, signed and dated 1992. 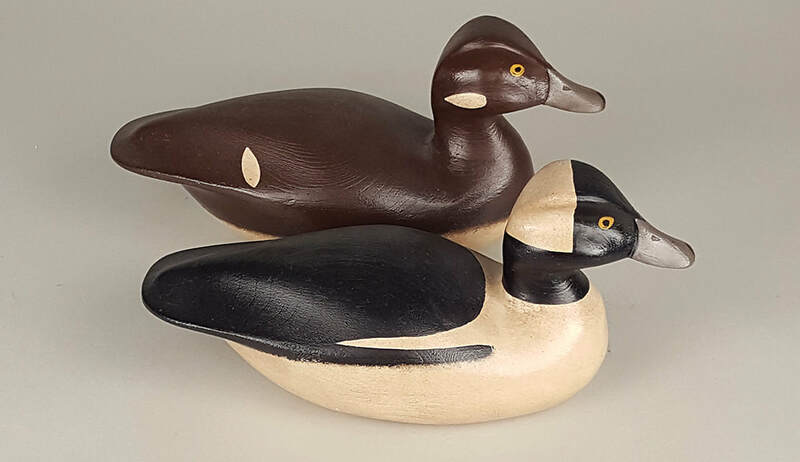 Pair of miniature buffleheads by J.J. West of Bordentown, New Jersey, signed and dated 1977. Pair of miniature old squaw by Pete Wilbur of Island Heights, New Jersey, ca. 1980. Pair of miniature buffleheads by Chip Allsopp of Point Pleasant, New Jersey. Pair of miniature green-winged teal by Herb Miller of Ship Bottom, New Jersey. Miniature wigeon by J. Eldridge Tyler of Crisfield, Maryland. Miniature long-eared owl by Curtis Waterfield of Knotts Island, North Carolina. 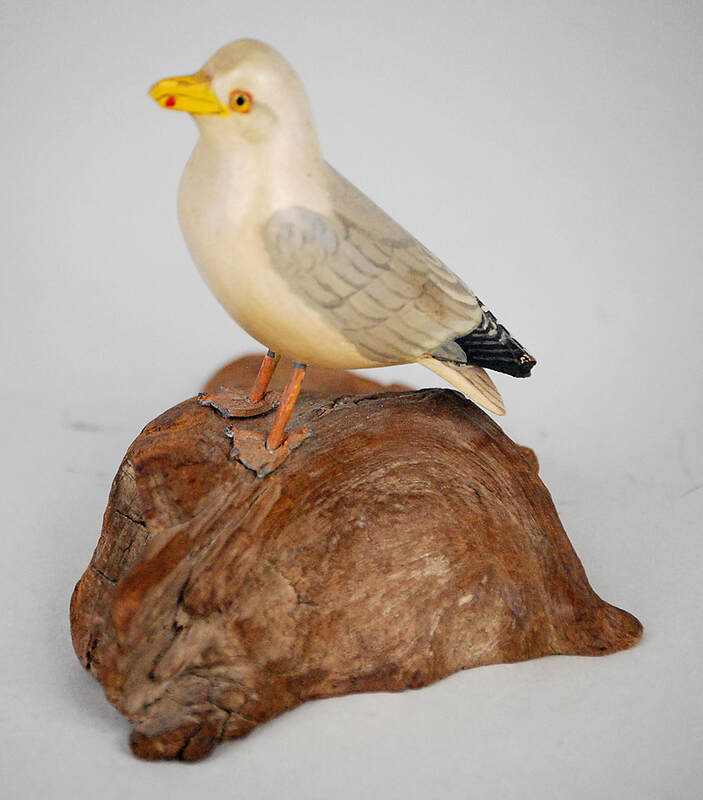 Miniature seagull by Robert Morse of Ellsworth, Maine, ca. 1940. 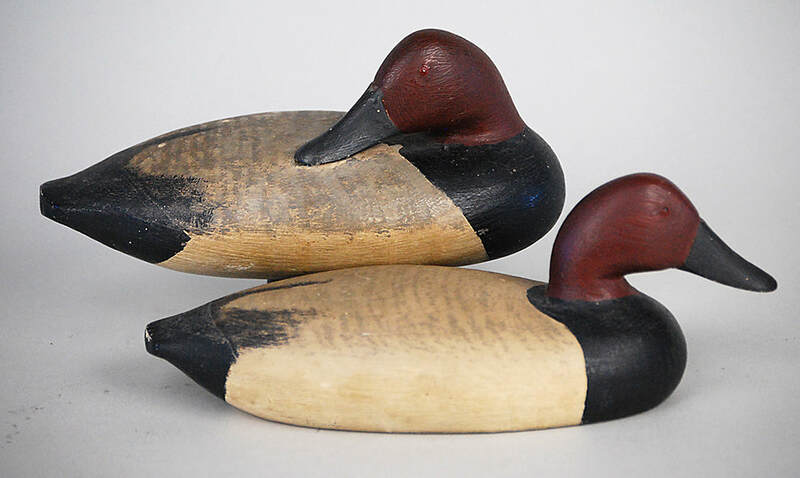 Pair of miniature canvasbacks by Charles Nelson Barnard of Havre de Grace, Maryland, ca. 1930. Miniature red-breasted merganser by Herman Wendt of Oshkosh, Wisconsin, ca. 1950. Pair of miniature canvasbacks from the Delaware River, possibly Frank Sidebotham, ca. 1950. Miniature Canada goose by Russ Burr of Hingham, Massachusetts, ca. 1920. 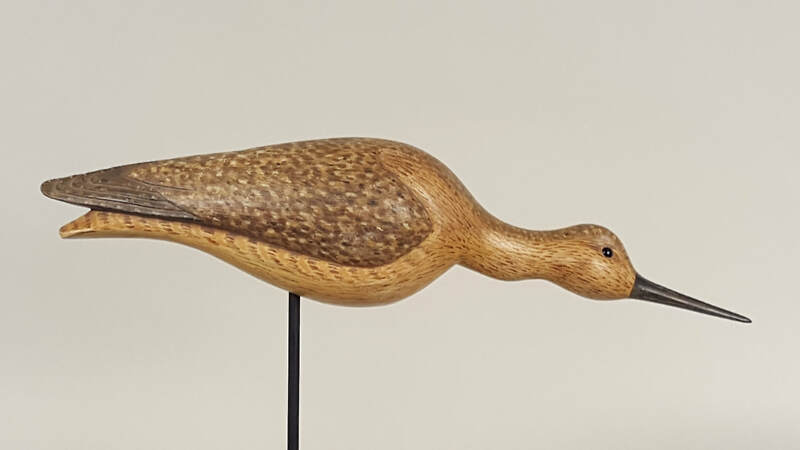 Miniature balsa-bodied Canada goose by Andrew "Grubie" Verity of Seaford, Long Island, New York, ca. 1940. 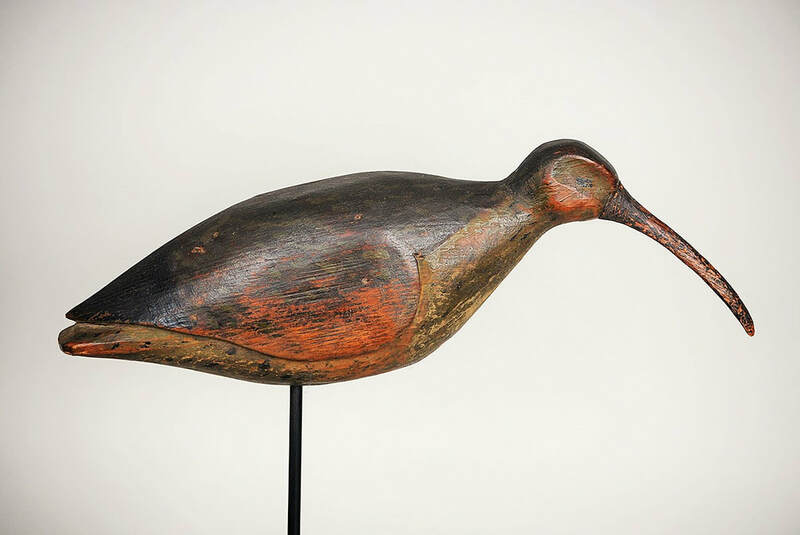 Miniature old squaw by Elmer Crowell of East Harwich, Massachusetts, ca. 1920s. 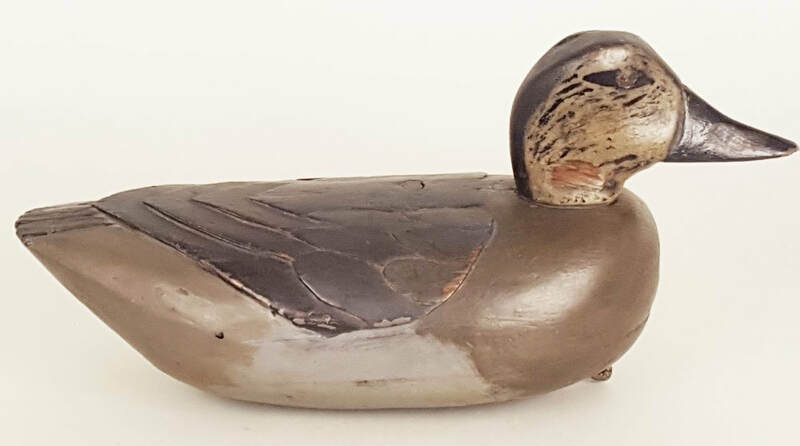 Miniature standing mallard, possibly by the Parker family of Parkertown, New Jersey, ca. 1920. Pair of Heron Lake style buffleheads by Pete Peterson of Cape Charles, Virginia. 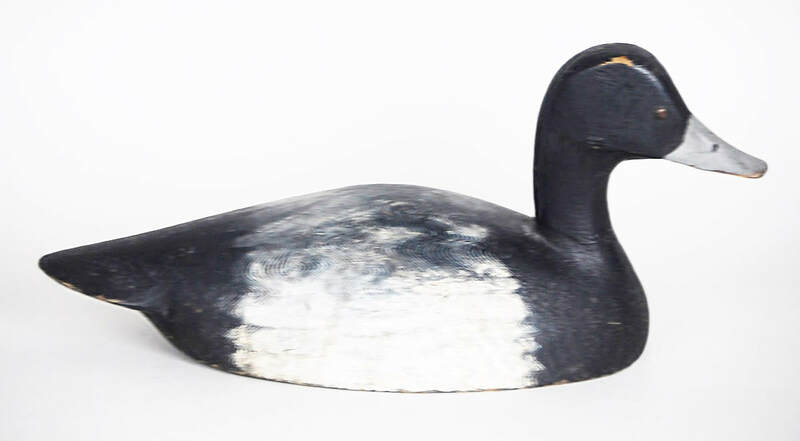 Canada goose by the Ward brothers of Crisfield, Maryland, signed and dated 1970. 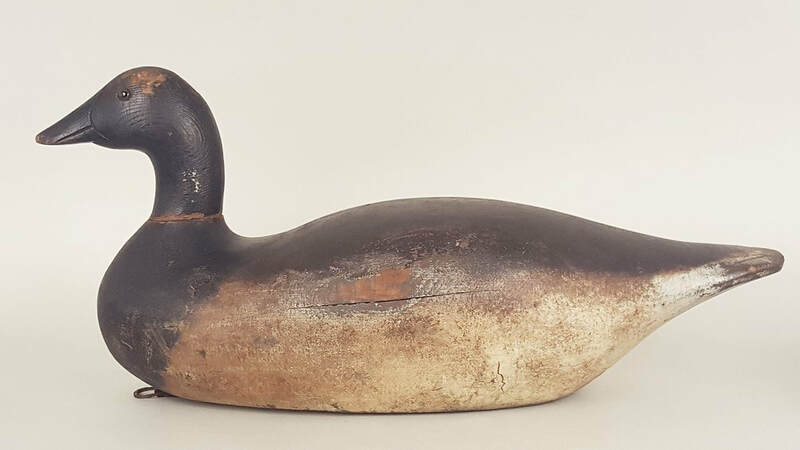 Bluebill by the Ward brothers of Crisfield, Maryland, signed and dated 1970. Pair of mallards by Ron Sabatini. Decorative standing green-winged teal by J. Corbin Reed of Chincoteague, Virginia. Ruddy duck by J. Corbin Reed of Chincoteague, Virginia. Red-breasted merganser by J. Corbin Reed of Chincoteague, Virginia. Blue-winged teal by J. Corbin Reed of Chincoteague, Virginia. 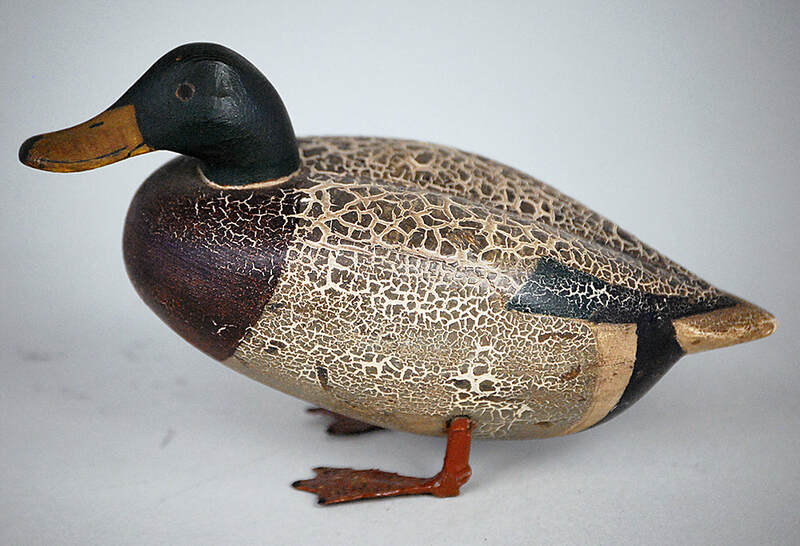 Mallard hen by J. Corbin Reed of Chincoteague, Virginia. ​American merganser by J. Corbin Reed of Chincoteague, Virginia. Hooded merganser hen by J. Corbin Reed of Chincoteague, Virginia. Hooded merganser by J. Corbin Reed of Chincoteague, Virginia. Feeding yellowlegs by Charles Spiron of Greensboro, North Carolina. Yellowlegs by Charles Spiron of Greensboro, North Carolina. 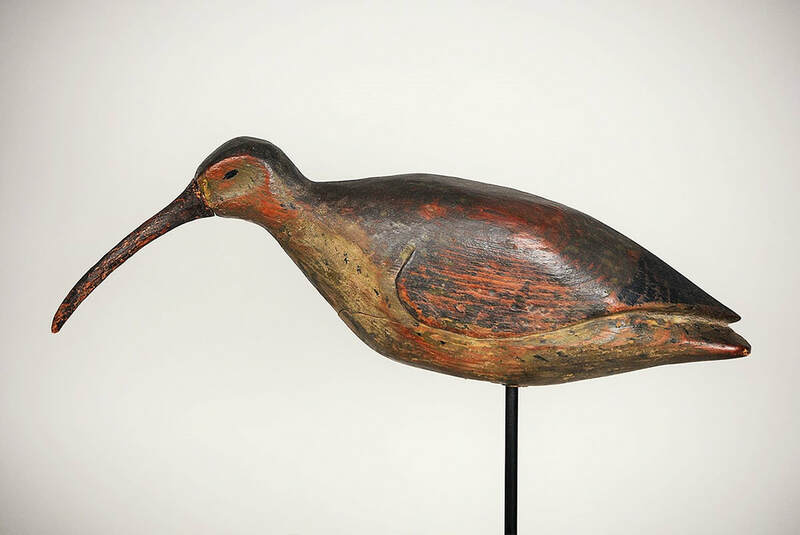 Curlew by an unknown maker of indeterminate age. 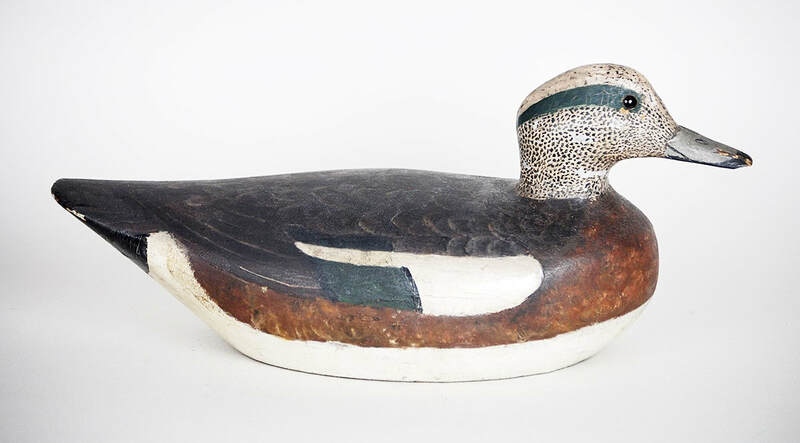 Black duck by Herb Miller of Ship Bottom, New Jersey, signed and dated 1992. Fill out form with your question or comment and submit.